Russia’s new military doctrine was presented this month by Chief of General Staff Valery Gerasimov, with stress placed on the need for Russia’s military to prepare for large-scale war that will use both conventional and hybrid warfare. “[O]ur armed forces must be prepared to wage wars and armed conflicts of a new type using classic and asymmetric methods of operations,” Gerasimov said in a March 2 speech delivered at the Academy of Military Science in Moscow. He stressed that Russia must be superior to “any potential enemy” and that military planners must make “every effort” to ensure “technical, technological and organizational superiority.” Gerasimov discussed the urgent need to upgrade Russia’s nuclear and non-nuclear weapons systems. He explained that Russia has already taken key steps toward this end, adding that it is vital for Russia to remain “a step ahead” of adversaries. Gerasimov’s proposals are significant because he is the same general who presented a report to the military in 2013, calling on Russia to rely more on hybrid warfare. These are asymmetrical military and non-military strategies, including unmarked troops, cyberattacks, political warfare and information warfare. The following year, Russia used several of those methods to forcibly annex Ukraine’s Crimean Peninsula and destabilize eastern Ukraine. It was also around this time that Russia ramped up cyberattacks and an information war on Western nations. Those strategies were remarkably successful for Russia, and they trace back to Valery Gerasimov. In the West, Russia’s emphasis on such hybrid tactics came to be called “Gerasimov’s Doctrine.” Given his influence and success in the recent past, Gerasimov’s new ideas for the military should be vigilantly watched. 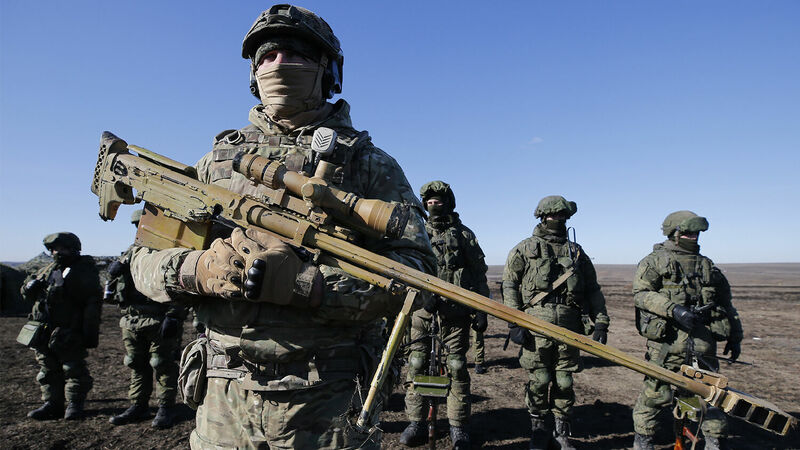 Trumpet editor in chief Gerald Flurry has often written about the significance of Russia’s increasing aggression, pointing out that among its main effects will be prompting the nations of Europe to unite militarily. Russian elections have recently moved President Vladimir Putin much closer to becoming a dictator. This strikes intense fear in Europe. The Europeans still remember how violent Russia was in World War ii, and Russia is a close neighbor with massive piles of nuclear weapons. … The Russian election is triggering a fear that will hasten the uniting of the European Union. … The whole world should be alarmed. The “tidings out of the east and out of the north shall trouble him”—united Europe. That means the frightening news comes from the northeast. Look on any world map and see who is located northeast of Europe—Russia and China, which will soon unite. The fear you see in Europe because of events in Crimea is going to cause 10 leaders in Europe to unite in a sudden and dramatic way—and in precise accordance with the Bible’s description of this European empire! In the years since that was written, Russia has grown more provocative, and the Europeans have grown more fearful of its provocations. Gerasimov’s new military doctrine is set to further accelerate those trends. Mr. Putin’s warfare is going to lead directly into the Second Coming of Christ. … What we are seeing in Russia ultimately leads to the transition from man ruling man to God ruling man! And it is almost here! It is just a few short years away. … We have to realize that this is all good news because Jesus Christ is going to return to this Earth at the very end of the coming world war. … Jesus Christ is about to return—biblical prophecy makes that clear.